This week’s Photo Challenge is Kiss. A few months back, a friend and client invited me to a corporate event. Not your typical corporate event: It was a “Battle of the Bands”, in which employee-musicians competed in front of a crowd of hundreds of other employees and business partners. 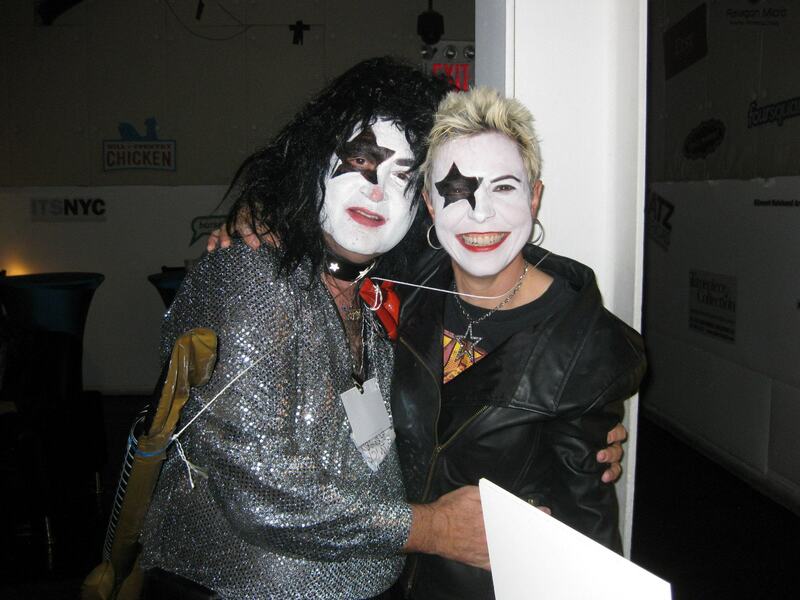 Knowing my friend is a huge fan of the rock group KISS, I volunteered to come dressed in full KISS attire. Hmm… I’d love to, but… As the president and CEO of an up-and-coming technology research firm, did I really want to show up in front of clients and other professionals dressed like a rock star? Isn’t there something about, you know, having an image to uphold? Much longer, though, were the preparations. Then there were the logistics. Prior to the Battle of the Bands, there was an actual formal(ish) event during which we technology folks were to get briefed on the company’s products and services. The CEO would be attending. Did I want to show up at this event in KISS makeup? In the end, I decided against that plan of action. 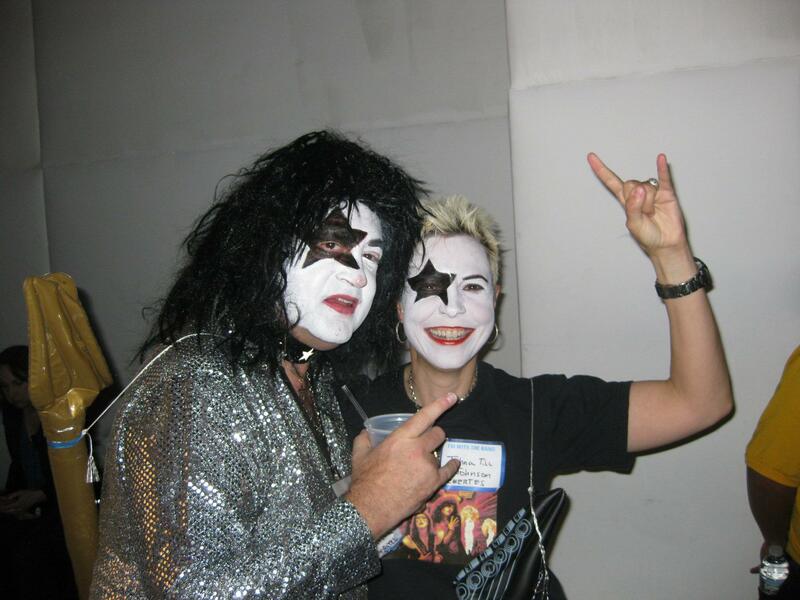 Instead, after the event, my friend and I swiftly changed into KISS gear and did our makeup, rocking out to the sound of “New York Groove”. 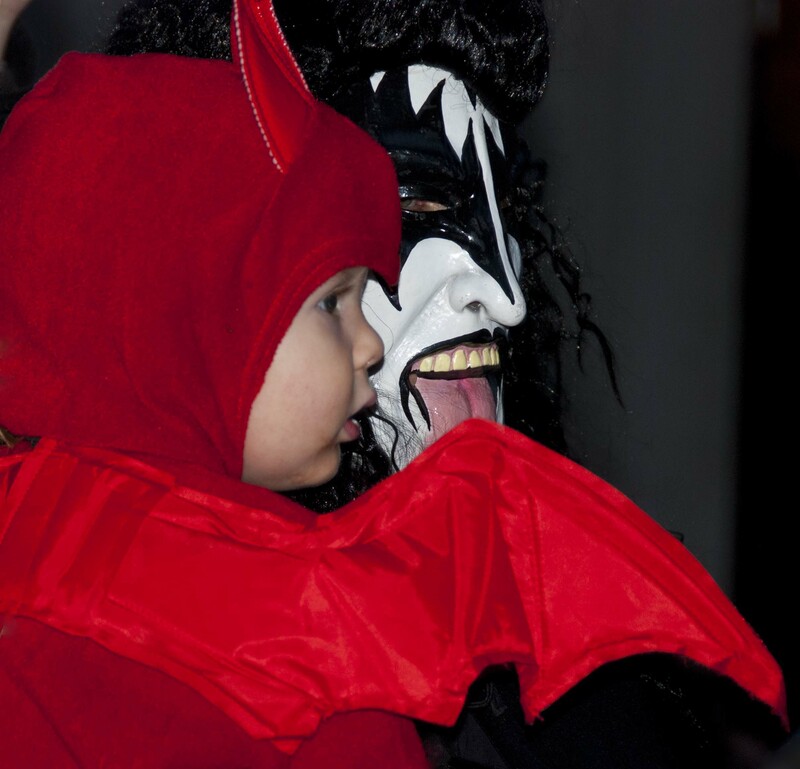 By sheer coincidence, some time before Vlad had taken a photo of a Gene Simmons lookalike at the Hallowe’en festivities on the Upper East Side. He didn’t recognize the costume, though: I had to provide some additional context. After all, by then I was an expert in KISS! This entry was posted in Life, Music, Photography and tagged Band, Kiss, Music, Photography, postaweek, postaweek2013, Rock, Weekly Photo Challenge. Bookmark the permalink. Thanks, I’ll let him know! Great take on the challenge. THat is Paul, not Ace though! You are so right! I need to update the post. That’s what happens when I dare to call myself an expert in anything ;-). Ha ha. My brother was a Kiss fanatic when we were kids – only reason I know all the names. Thanks! It was Vlad’s idea, actually. Your brother has (had?) good taste! Thanks! The shots are from random bystanders, on my friend’s camera. (All except the last one, which Vlad took). The KISS of kisses. Nicely done, Johna! Love it … glad you let your ‘hair’ down! What there is of it :-) Thank you! You’re so right, Jeff! Correction made. Thanks for reading (and noticing). Wonderful! As you can see, I was doing plenty of smiling, too! Nicely done–like your interpretation of the theme. Thanks! I’d take credit, but the idea was Vlad’s. (He basically said, “Tonight you have to write a blog post–I need you to write it up because I can’t.) I love getting writing assignments like that, especially on Friday evenings….. It totally was, Lynn! The whole evening was amazing. My favorite part was when the fiftyish, rather buttoned-down CEO ended up crowd surfing—and none of his employees dropped him! how fun! i loved scrolling through this narrative!!!! thanks for taking us along; the event was surely a success! Thanks, Z! It was a successful event–and lots of fun for me! Pingback: Weekly Photo Challenge: Kiss of Life « What's (in) the picture? Pingback: Weekly Photo Challenge: Kiss back in Time « What's (in) the picture? Thanks! It was Vlad’s idea, as noted above, so he should get the credit. You’ll have to credit my friend and Vlad most of the creativity… I just followed instructions :-). A brilliant interpretation. I wish I could have done it myself. Well done. Pingback: Weekly Photo Challenge: Kiss? « What's (in) the picture? Good job on the makeup and good picture for the kiss challenge. I was going to buy a big hershey kiss candy, but I didn’t. It was a hell of a lot of fun to do the makeup. I learned tips about makeup I’ve never known….And I think you listened to your better angels on the giant Hershey kiss! It would have been a wonderful photograph but *such* a temptation…. My absolute pleasure having you join me for a memorable night!!! From our 65yr old CEO crowd-surfing, to the awesome photos rocking out….. That was my favorite analyst event ever!!!!!! Thanks for making it so much fun. And you have the special honor of being the only woman I have ever put makeup on and you looked AMAZING!!! No WAY is your CEO 65! I felt bad about even saying “fiftyish”–maybe I should just stick with “prime of life” from now on!! And the music was great, too—even though I don’t recall them playing KISS. Next time, Bernard–you can’t let them get away without it!! That is great. Love the make up and the spirit behind it. :-) Thanks so much for visiting and commenting! Too cool! 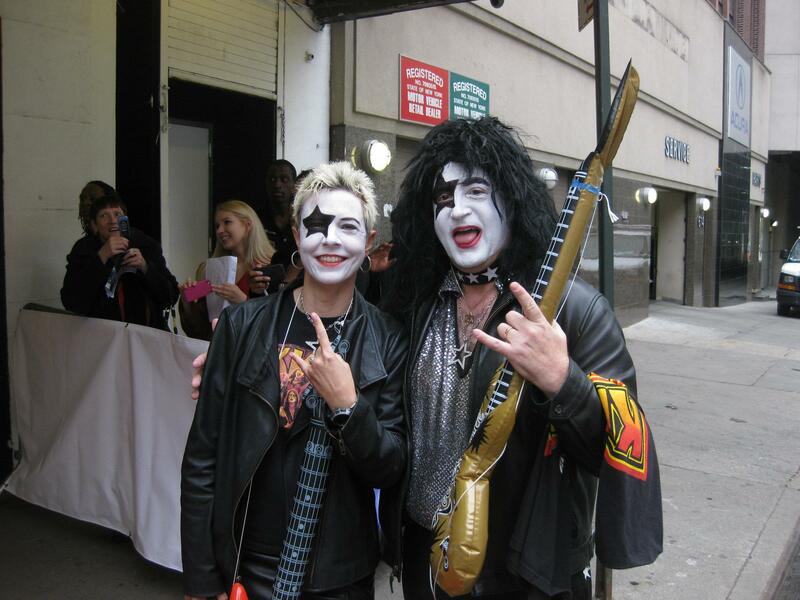 I am not a fan( I will admit, KISS was hot when I was in high school) but, KISS is fun :) Great makeup job, guys!! Hi Xpat…. Thanks! I was not a fan back then, either, but listening to the music now makes me seriously wonder why–it’s bouncy, driven, melodic.. everything you want in a rock band!